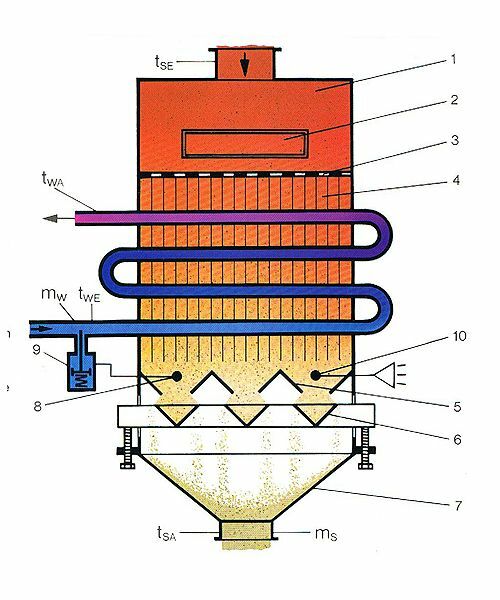 The reflux cooler is especially suitable for granular free flowing bulk materials, as it is a contact cooler. The material to be cooled slowly flows along the water cooled cooling faces in counter current fashion. Water does not of course come into contact with the bulk material. 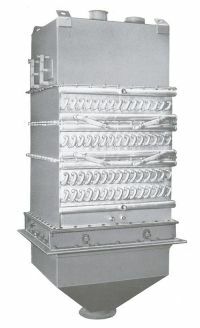 The special design of the contact areas between the cooling segments and the cooling spirals ensures that a high degree of heat exchange is achieved. A constant temperature of the cooled bulk material is achieved by automatically controlling the flow of cooling water. 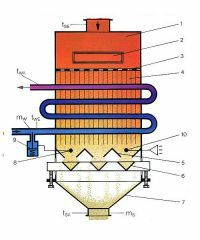 The reflux cooler can also be used to heat free flowing bulk material. 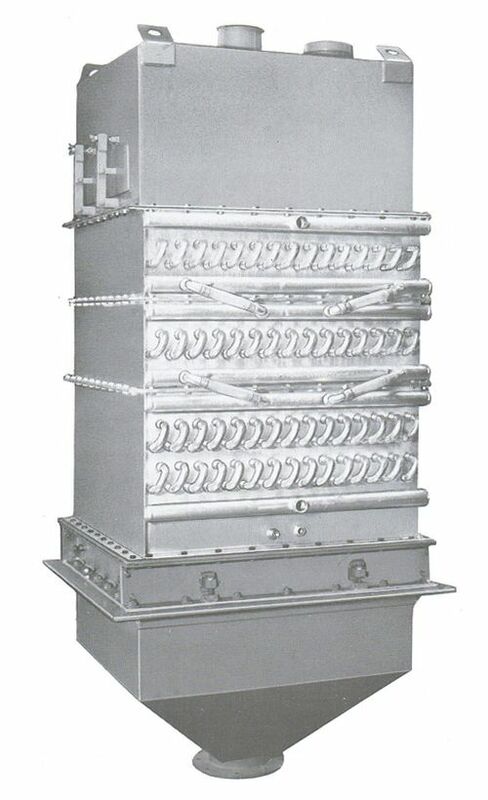 The material to be cooled runs out of a hopper via a charging box (1) and a sieve (3) into the cooling packet (4). Below the cooling packet there is a stationary part (5) and below it is the adjustable part of the dosage closure (6). This closure is adjusted depending on the required cooling capacity and it ensures that the material will pass through the cooling packet (4) equally distributed over the whole cross section of the cooler and at the prescribed speed. The material passing through is collected in the discharging hopper (7). Between the cooling packet (4) and the dosage closure (5) a thermostat (8) is installed which regulates the temperature of the bulk material via the cooling-water control valve (9). The contacting thermometer (10) only reacts if the max. required temperature of the cooled bulk material is exceeded. In this case the cooler outlet is closed and/or an optical or acoustic sign is given. In this case the cooling packet is provided with water by two separate cooling water circuits. By means of a special circuit of water the peak temperatures of the bulk material are cooled down. The second water circuit with its regulation operates just like the one-stage cooling. However, an indicating thermometer substitutes the contacting thermometer.